Happy Thursday!!! 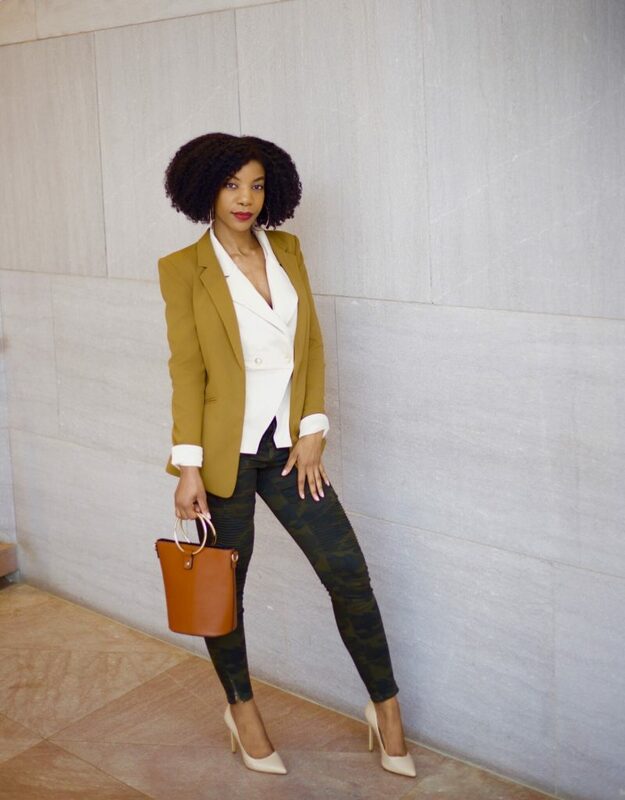 Since it’s fall, aka “blazer season” (I just dubbed it that myself,lol), I have styled yet another cute blazer from my friends at SheIn. 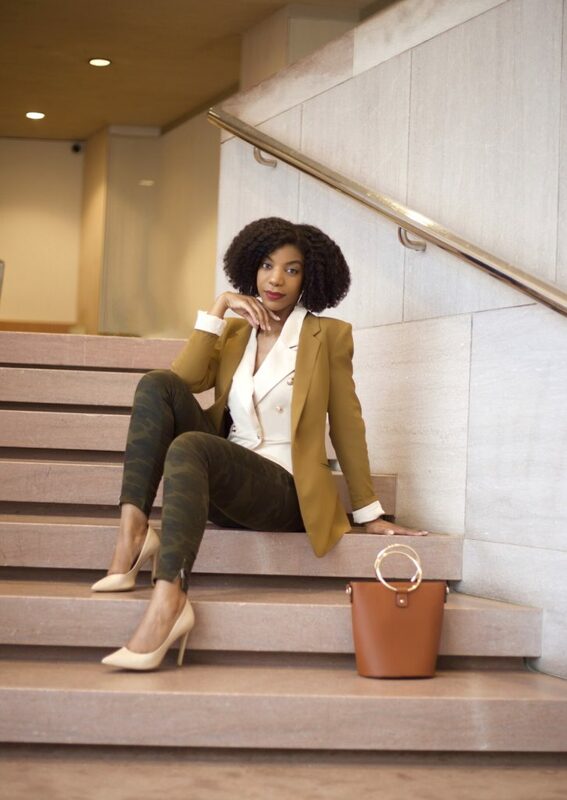 I’m a lover of all things neutral, and all things gold, so when I saw this blazer top on SheIn’s site, I had to have it! I love the material. It’s a good quality, soft, and has a slight sheen to it. The gold military style buttons are like the icing on the cake! I decided to layer it with this tan blazer since it’s lightweight, and since it was a little lose. I have the cream blazer pulled a certain way in the back to make it more fitted, and the tan blazer did a great job of hiding my quick fix! The smallest it comes in is a size Small, and again, I’m not working with much on top, but I still love the blazer. I would recommend you going one size down in this as well (unless you’re working with more, lol). I kept the accessories neutral and easy, as per usual. As you can see, I’m just in love with this purse from Forever21! Such a great purchase! I wish it was still available online so that I could link it here. I found similar options linked the here, and here. Thanks for reading! Will you wear a double blazer look like this one? Let me know below! This is perfect for fall. It’s also a great transition look. You can wear this to the office but then also be stylish for happy hour. Cute look! 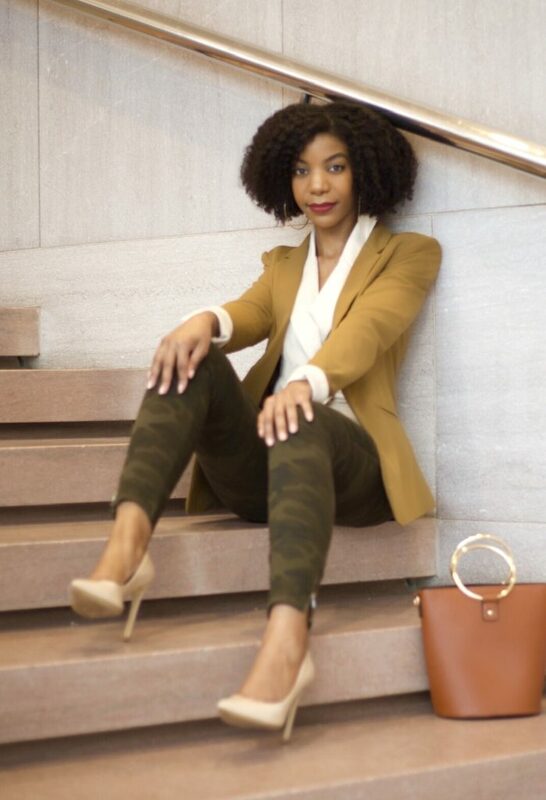 I loved how you style these camo pants! I recently bought some but took them back because I just don’t have anything that matches them. Perfect color and fit. You are rocking blazer season! I love this look. Fall is my favorite time of year for so many reasons fashion and color being a couple of them. Blazers are perfect for the fall. I wear them as jackets. I like that you can dress them up or down and they still look good. That is a great look and something I would wear! It’s totally me. I think I have that blazer. I have been searching for the perfect camo pants but haven’t found one. Love the corporate but cute look. The color of the blazer is perfect. I like the color and style of this blazer. I also love the pants. Love the pants, I was just telling my mom that I wanted to add some camo to my wardrobe! I love how you dressed the pants up! Gosh what can’t you style! 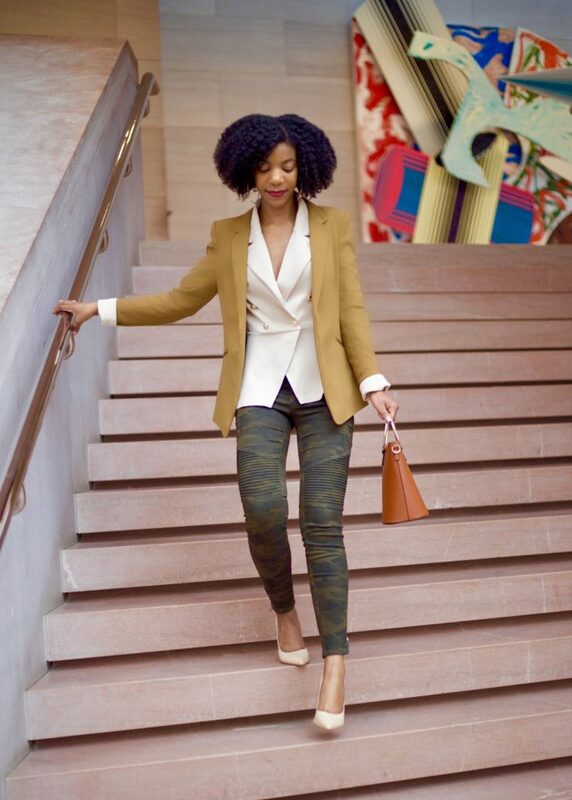 This camel colored blazer is everything i want one! YESSSSSS this is a LOOK! You’re making me want to go out and get ALL the blazers!